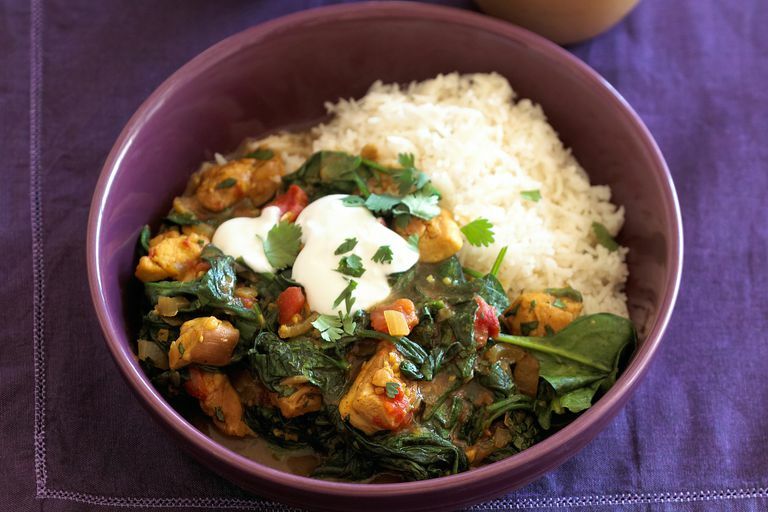 Palak chicken is a delicious spicy Indian chicken with spinach dish. You can serve it as a hearty gluten-free main course with basmati rice, with or a bread such as naan. It is quick to prepare if you have the ingredients on hand. This spinach chicken dish is high in protein while being low in calories, fat, and carbohydrates. It's a great way to enjoy healthy vegetables, even using those from your garden, in season. You will want to make a trip to the Indian grocery to get fresh curry leaves, garam masala, black cardamom pods, and Indian red chili powder (similar to ground cayenne pepper, which you could substitute). While you can make the dish without fresh curry leaves, they add a pungent element that isn't found in dry curry powder. Once you have all of the ingredients stocked, you'll enjoy making this dish and other Indian-spiced dishes. Cut the boneless, skinless chicken breasts into cubes about 1 inch on each side. If you are using frozen spinach, defrost it and wring all of the water out of it. The dish will taste much better if all of the water is wrung out. Set it aside. In a large skillet, heat the oil and fry the fresh curry leaves for 20 seconds, add the cinnamon, black cardamon, cloves, and bay leaves, and cook another 20 seconds. Add the ginger, garlic, and tomato sauce. Stir this in the pan and then add the turmeric, coriander powder, garam masala, red chili powder, salt, and half of the cilantro. Stir. Add the chicken. Cook the chicken with the mixture in the pan until the water that cooks out the chicken and vegetables evaporates, about 10 to 15 minutes. Garnish with the rest of the cilantro. Serve with basmati rice or with a bread such as chapati, roti, or naan. Palak chicken would usually be served along with a yogurt raita and vegetable dishes. Store any leftovers in a sealed container in the refrigerator. Leftovers can be reheated in the microwave for lunch or for make-ahead dinner entrees. A little chopped fresh cilantro will brighten the leftovers after reheating. The amount of spicy heat in this dish is determined by the red chili powder and the garam masala. It's easiest to increase or decrease the amount of red chili powder you use to get it to your chosen amount of heat. Some garam masala blends are more spicy hot than others. If you don't use garam masala, you may want to add some of the spices typical for that blend, which include peppercorns, cloves, cinnamon, mace, cardamom, bay leaf, cumin, and coriander. You can use fresh, ripe tomatoes instead of tomato sauce. Process them in your food processor or blender into a puree. You should use about 2 cups of tomato puree so it will concentrate during cooking to equal 1 cup of tomato sauce. You can substitute fresh, steamed spinach for frozen spinach. You will need about 1.5 pounds of fresh spinach to equal one 10-ounce package of frozen chopped spinach. Rinse fresh spinach well to remove any grit. Steam it in a steamer or the microwave to wilt the spinach. Allow it to cool and then wring the steamed spinach well to remove as much water from it as possible.